The head is large, with a rounded skull and pronounced occiput. The plane of the muzzle is parallel to the top of the skull. The skin is loose-fitted and falls in folds on the head. The velvety ears are very long and should meet beyond the top of the nose. They should fold and not appear flat. The large teeth should meet in a scissors or level bite. The lips hand down with loose flews. The sad brown eyes should show prominent haw. The expression should be kindly without any harshness. The Basset has a very pronounced dewlap. His chest is very deep and extends in the front of the forelegs. The paws are big and the hindquarters are round. Dewclaws may be removed. The dog"s movement should be deliberate, but not clumsy. The coat is short, hard and shiny. There are no rules concerning color, but it is usually white with chestnut or sand-colored markings. 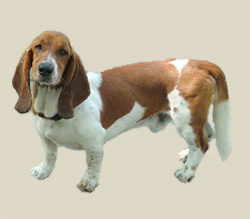 The basset needs mild daily exercise, which can be satisfied by walking on leash or playing in the yard. It does best as a house dog with access to a yard. Its coat needs only minimal grooming, but its face may need regular cleaning around the mouth and wrinkles. Bassets tend to drool.